Martin & Moran Property Advisors are excited to launch this unique Dublin City development. 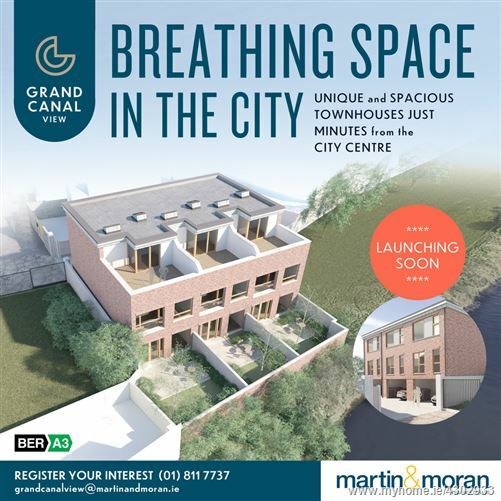 "Grand Canal View", Dublin 8 will consist of 3 boutique homes all of which will be finished to a walk-in, show house specification and yet situated only 2.5km from St. Stephen's Green. Number 1, 2 & 3 Grand Canal View are carefully designed homes that combine traditional craftsmanship with the very best in modern construction to provide exemplary A rated energy efficient family homes. Whilst enjoying a classic brick exterior, each home features modern energy saving devices and up to the minute technology in terms of modern kitchens, bathrooms and internal finishes. Each particular detail has been selected to ensure that Grand Canal View offers the optimum living experience to the new owner. Each house is laid out over three floors, will have three double bedrooms (plus a very large study room) with the master bedroom incorporating an en-suite and spacious walk-in wardrobe. Access to your own private terrace garden / balcony is enjoyed from each floor level where a peaceful view over the Grand Canal will take you away from the hustle & bustle of City life. PRICES & EXACT LAUNCH DATE ARE YET TO BE CONFIRMED.